The nation-wide tantrum being thrown by the far left manifest again this weekend, this time in Berkeley, California. Saturday saw Antifa mobs clash with Patriot Prayer members and police alike in Portland, Oregon and now the fight has moved to California. Antifa members dressed in black clothing and armor carrying a variety of weapons clashed with anti-Marxist protesters near Berkeley park. Around two dozen vehicles were vandalized in the riot, many had their windshields smashed and one was even set on fire. Berkeley police issued a statement saying, "There have now been 20 arrests, most of them for possession of banned weapons in parks, and on streets and sidewalks. Dozens of weapons were confiscated…Even though there were many hundreds of people, many of whom came armed and hostile, there were no significant injuries to anyone." Berkeley police expressed surprise at how few injuries there were considerating "that extremists threw explosives at Berkeley Police and Alameda County Sheriff’s Office mutual aid officers." The rally that drew the Antifa mob was a "No to Marxism in America 2" rally near Berkeley’s Martin Luther King Jr. Civic Center Park. It began with verbal insults between the two groups as armored riot police stood and watched. The harsh words soon erupted into physical altercations. Ben Bergquam of a group called Front Line America said, "I'm here to stand up for America and stand-up against the Marxists in this country that are trying to undermine our country from within." 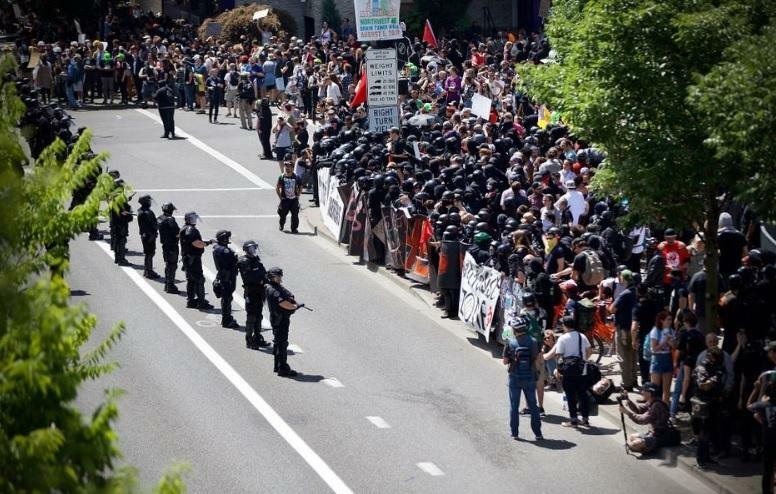 Much like Saturday's clashes in Portland, police confiscated items that could be used as weapons such as poles, bats, bricks, knives, pepper spray. These items and more including firearms are banned from the rally. Police noted, "These rules are intended to assist those wishing to peaceably express their First Amendment rights." Anyone caught with prohibited items was subject to citation and arrest. The Berkeley police statement continued, "There are concerns that the motivation behind some of the Aug. 5 events is to mark and revive violent conflicts that occurred during protests in Berkeley in 2017, both on the University of California campus and in city parks and streets." I also Thank the Berkeley Police for arresting violent protesters. God Bless you all. Those two look like really upstanding members of the community, NOT! These idiots are letting people like soros and other elitist destroy their lives and their to stupid to even realize their being used by people that hate them and hate their country. Wake up fools! The names and Mugshots please. Is there a site OUTING ANTI-FA Leaders and minions after they have been arrested? Posting Mugshots, names, claimed home city of origin? None of them got beaten to their knees and maced?